News in overnight from Cornelius Kistler at Sunseeker Germany that he's sold a 22m 2013 Sunseeker Manhattan 73 motor yacht. The Manhattan 73 is defined by its ingenious use of space. The vessel enjoys increased volume not just by length but also by courtesy of the broad beam that's carried lower in the hull. This enables a third full-size double stateroom on the lower deck, plus plenty of headroom throughout. The main saloon is now also on one single, sweep-through level, providing a vast entertainment space. Finally, for ultimate manoeuvrability, there's the option of joystick control, dramatically simplifying docking. 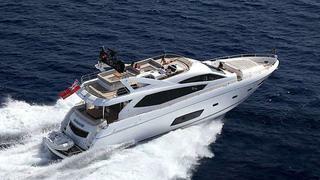 The Sunseeker Manhattan 73 was asking £2,310,000 and will be named Nachtwind.